Another attempt to manipulate my poem into an image. This time I’ve used Tagxedo – another tool I’d never used before (note: uses Silverlight, so I had to use Firefox, not my beloved Chrome – hmmm, I wonder if folk will be able to view this?). You can either add a url or past in text – I pasted in the 6 words from Sheri’s challenge again. If the first image does not load, I have taken a screen shot and added it at the end. There’s a good selection of shapes to select – I chose a cat as one of my little darlings is peering through the window watching me. 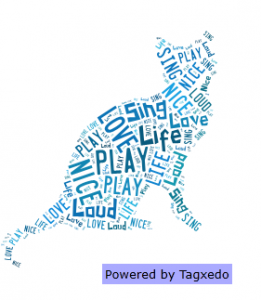 Another cool feature of Tagxedo is that mousing over words and clicking on them takes you a Google search about that word. Now I need to think about remixing this poem further. Any suggestions? This entry was posted in #CLMOOC, Poetry, Technology and tagged #clmooc, poetry, remix. Bookmark the permalink.